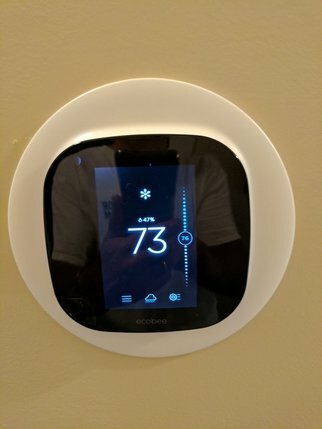 ​We have an Ecobee Thermostat in both the living area and the bedroom floor. To change the temperature, just place your finger on the temperature within the circle (as shown as 76 in the photo) and move the number up or down. When you adjust, it will change to your temperature and stay that way for four hours. The normal thermostat temperature is set for 73 or 74 degrees in the living room degrees during the day and 75 degrees during the day and 69 at night in the bedrooms. If this is uncomfortable for you, email me and I can adjust. You can manually adjust also as discussed above. ​We have HULU LIVE TV for our "cable". We also have NETFLIX. Use the Amazon Fire Stick remove to work the TV. Press the Home Button for the menu. There is an Alexa voice button. You can speak things like "What is the Weather today, or ESPN on Hulu, etc." Inside Hulu, when asked who is watching, select one of the Cottage Profiles. You select by pressing the center of the large black button. You can add shows to "My Stuff" and they will record for you. To watch live TV, scroll to the live TV (lightning bolt), and select. Or you can press the speaker button and state for example, "Fox News on Hulu." If you select live TV you can select Watch (on the bottom right) or Guide to see all shows available. To select the guide, press the bottom part of the outer black ring on the Amazon Fire Stick remote. ​​To watch Netflix, simply click on the Netflix app or press the speaker button and say, "Netflix App." Select 107 Summer House when asked who is watching. Press the home button on the Amazon Fire Stick remote to go it is main menu at any time. ​All bedrooms have TCL ROKU TVs. Turn on the TV. Select either either Hulu or Netflix. On Hulu select the room when it asks who is watching. On Netflix, select 107 Summer House. Use the remote to watch live TV or other shows on Hulu (see above) or Netflix show. ​To get to the live TV guide on Hulu, select live TV, then press the down arrow on the TV Roku remove for the guide. ​IMPORTANT: DO NOT SIGN OUT OF EITHER NETFLIX, HULU OR AMAZON. PLEASE MAKE SURE THE REFRIGERATOR’S TEMPERATURE SET AT 37 DEGREES (NOT LOWER). According to a technician that actually makes it NOT work as well if it is set lower. HERE IS A TIP: If you have bought or brought several canned drinks, put them in the freezer first for 25 minutes or so. Then move them to the refrigerator. Putting several room temperature drinks in the previously empty refrigerator takes a long time to get cool. a) Place all dirty dishes in the dishwasher and start it. Any that won’t fit should be washed and put away in their designated places. c) Leave the beds unmade. It is helpful if you remove the sheets and leave them on the bed. d) Remove all trash as discussed above. e) The refrigerator shall be emptied. CHECK OUT TIME: Check out time is 10:00 a.m. eastern time. Check in is at 4:00 p.m. eastern time.